During the month of March, three award-winning children’s authors will entertain and enlighten children at the Evanston Public Library: Sherri Duskey Rinker, author of Goodnight, Goodnight Construction Site, and Celebrate You! on March 10; Natasha Tarpley, author of I Love My Hair on March 27; and Cleopatra Alexander, author of the Shiny the Sea Star series on March 30. 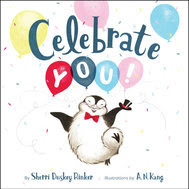 Sherri Duskey Rinker is a bestselling picture book author who will present her latest joyful children’s book Celebrate You! Four of her picture books have appeared on the New York Times bestseller list, with Goodnight, Goodnight, Construction Site being featured for at least four years. Her charming new picture book Celebrate You! recognizes and celebrates all the small but important milestones on the way to growing up, from the first wobbly baby steps to the time when they’re ready to leave the nest. With irresistible illustrations and an inspiring message, Celebrate You! will cheer and encourage readers of any age. Rinker will share her work with Evanston readers on Sunday, March 10, from 3 to 4 pm in the Main Library’s Community Meeting Room. Children of all ages are welcome, although the book is best suited to those aged 3 to 6 (and their caregivers). 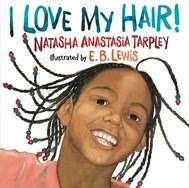 A storytime and craft are scheduled with Chicago author Natasha Tarpley, author of I Love My Hair!, on Wednesday, March 27 at 2 to 3:30 pm in the Main Children’s Room at the Main Library. The author will read from her classic children’s book, which just celebrated its twentieth anniversary, and share some of her personal experiences about her hair as she grew up. The reading will be followed by a hands-on craft. This event should appeal especially to young black girls, possibly from kindergarten to third grade. From a very young age, Tarpley understood that stories were powerful; that they could shape beliefs and change the world. In her writing for children and adults, she strives to diversify mainstream representations of kids and people of color, while emphasizing the fundamental commonalities of all human beings. She is the cofounder, along with her mother, Marlene Tarpley, of Voonderbar! Media, a multicultural children’s media project with a mission to expand depictions of children of color in literature and other media. 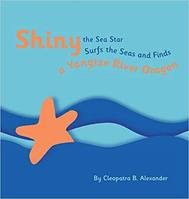 Author Cleopatra Bugelas Alexander will be reading from her Shiny the Sea Star picture book series. Suggested for children ages 3 to 7, these books feature Shiny the Surfing Sea Star who travels to the rivers of the world in search of new friends and adventures. By following Shiny on his adventures, readers will understand that we are all connected by water and can make friends everywhere. The books, which are beautifully illustrated by the author using origami paper cutouts, feature colorful characters including Handy the Octopus, who owns a travel store; Bernice and Bernard, his seagull travel team; Royal, the Bengal Tiger; and Rover, the Whale. The author will pay tribute to Muriel Schwartz, the longtime Evanston North Branch children’s librarian, by introducing Ms. Muriel, the Dolphin Librarian, who inspires Shiny to continue his adventures. A third-generation Evanstonian, Cleopatra served on the School Board of Evanston/Skokie School District 65 and is an ETHS Distinguished Alumni Award Winner. Books will be available for purchase and signing at this event on Saturday, March 30, at 1:00 pm, in the Barbara Friedberg Room of the Main Library. All three events will take place at the Main Library, 1703 Orrington Ave. Admission is free and registration is not required. Posted in Library NewsTagged children's authors, children's books, evanston public libraryLeave a Comment on Children’s Author Events in March! My name is Andalib Khelghati. I was born in West Africa and grew up in a home where we spoke French, English and Farsi. I work at Dewey Elementary school and am proud of all our Dewey Tigers. My favorite hobby is learning about new places, languages and traveling. I believe reading is a powerful tool for unlocking life’s hidden secrets. This fast-paced thriller brings together action and politics for a novel that is a true page turner. This book is a must-read for anyone looking to get completely engrossed in classic Clancy. Why is George so curious? And what kind of monkey is he anyway? Parents of toddlers might find themselves pondering the deeper mysteries of children’s books after reading a favorite story night after night seventeen bedtimes in a row. They want to get beyond the obvious plot and characters. Questions come to mind: Why is George curious? Are monkeys really that curious? What kind of monkey is he? Are some monkeys more curious than others? Now, thanks to authors Alexandra Horowitz and her husband Ammon Shea, some of these questions can be addressed. In this enlightening article in the January 1st New York Times “Sunday Review” section, Horowitz and Shea present the cold, hard facts of scientific research to answer some of the knottier questions. They wisely stopped short of delving into too many of them in the interest of preserving the magic of childhood, but it is comforting to know that should I be blessed with grandchildren in the future, and should my mind wander during the umpteenth reading of, say, The Little Engine that Could, there is a good chance I’d be able to find out if that little engine really could have pulled it off. 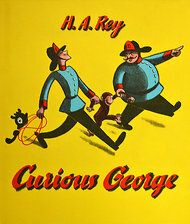 Posted in Off the Shelf, UncategorizedTagged Alexandra Horowitz, Ammon Shea, children's books, Curious GeorgeLeave a Comment on Why is George so curious? And what kind of monkey is he anyway? Today’s New York Times points out that most plugged in, etext-only adults still prefer physical print books for their children. (For Their Children, Many E-book Fans Insist on Paper) The reasons vary: ebooks and ereaders are expensive, offer poorer selections, can’t convey illustrations well. There’s also a great deal of affection for the tactile, physical experience of sharing books with a child, difficult to replicate with a Kindle. Posted in Off the Shelf, UncategorizedTagged children's books, ebooks, reading to young children2 Comments on Should children read ebooks? The ten best illustrated children’s books of this year were announced in the November 3 issue of The New York Times. The artwork from the winners will appear in the special Children’s Book section of the Book Review’s Nov. 13 issue. See the article and some of the art here. The Wall Street Journal celebrates the legacy of the late Denis Dutton, a writer, philosopher, and the creator of the popular website Arts & Letters Daily. Offering readers fresh daily links to the very best writing on books and culture, Dutton built ALD as an “elite meritocracy” that gave equal voice to quality journals of all sizes and perspectives. Author Michael Chabon discusses his abandoned novel Fountain City with The Atlantic. After 5 years and 1500 pages, Chabon “wrecked” the novel before going on to write Wonder Boys. Here he talks about his recent decision to publish four annotated chapters of Fountain City in McSweeney’s. This NY Times essay explores the art of the extremely long sentence in novels such as James Joyce’s Ulysses and a host of more contemporary works. With an appreciative eye, the article celebrates the beauty in 36, 117, and 158-page long sentences in the era of 140-character Twitter posts. Posted in Extra! Extra! Read All About It!, Off the ShelfTagged children's books, Denis Dutton, experimental literature, Michael Chabon, Rikers Island, What EPL is ReadingLeave a Comment on Extra! Extra! Read All About It!